If styled right, a cap is a wonderfully useful accessory. 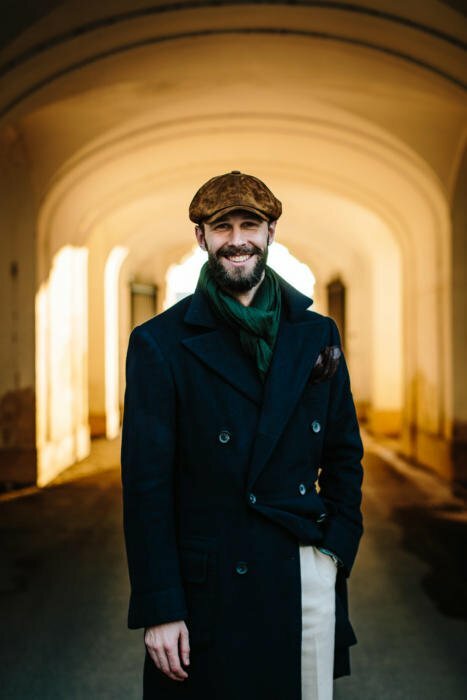 Not as formal as a fedora, yet not as casual as a beanie, it can bridge a greater range of outfits than any other hat. When the temperature is in single figures, and your lack of hair makes a hat a necessity, this makes a good cap extremely valuable. But as with many hats, they require some thought as to shape, proportion and colour in order to suit the wearer. The basics are similar to buying a good fedora or trilby: you want something that echoes the proportions of your face (and to an extent your overall body shape). So if you have a large, round face, you need a larger, rounder cap. Of course, caps don’t have the same number of permutations as a hat - brim width, crown height, crown taper. But the way the body of the cap is cut makes a surprisingly big difference. For example, I always used to think that eight-piece caps, as I’m wearing here, were too big and floppy for me. The vast majority are, but they don’t have to be. You can still make an eight-piece model that is relatively trim, it’s just that most aren’t made that way. 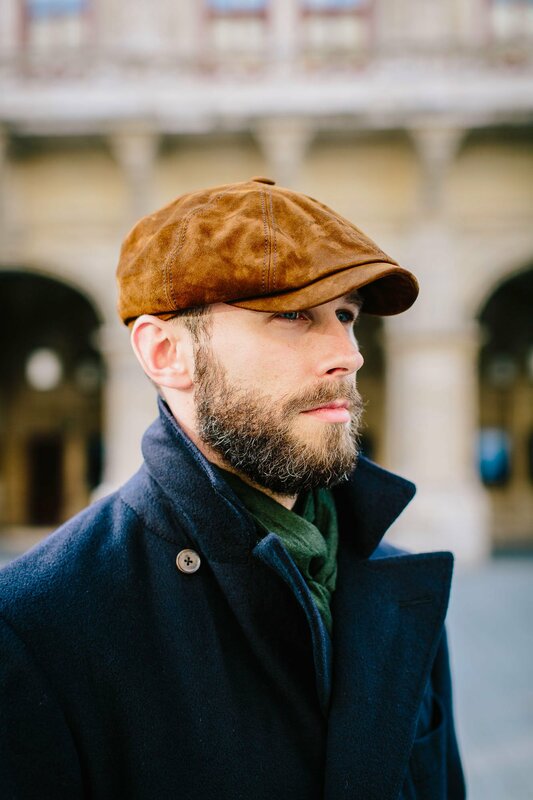 I happened to try this cap at Lock & Co last year (the Indie suede model) and noted that it suited my face better than most - particularly with the brim enthusiastically bent and rounded. Unfortunately, they had just sold out of my size (59) so it wasn’t until last month that I was able to buy one. They also made it in a slightly darker shade of suede this year, which is much more versatile. The other cap I have is a navy Wigens cashmere model from Trunk. The fact it’s dark makes it more versatile than the suede, and it’s Storm System-treated which makes it a lot better in the rain. It is a classic flat-cap style, made with a single piece to the body. And yet the proportions are very similar to the Lock & Co eight-piece: rounded around the top of my head, but not flopping over to one side or the other. I find the other Wigens caps too narrow and small in the head for me, so it’s not even a case of a particular brand being of one type - just the model. As mentioned, body shape is also somewhat relevant. A larger or taller man will find it easier to wear a larger hat of any sort; smaller or shorter men may be better with something neater. But consider face shape first. In terms of style, anything that makes a cap seem more personal and worn-in will help - like that rounded brim. And try to keep the formality of the outfit roughly in line with the cap. A hairy Harris tweed is not going to work with a worsted suit. Finally, I would say that as with much of what we discuss on Permanent Style, this is how to master the basics: how to dress subtle, simply and elegantly. A short man with a thin face can look great in a big, floppy newsboy cap. But it will be a question of fashion and character. If he’s still wearing that style in five years, credit to him. But it’s unlikely. Green cashmere scarf by Loro Piana. Peccary gloves from Lavabre Cadet. You can follow the discussion on The cap by entering your email address in the box below. You will then receive an email every time a new comment is added. These will also contain a link to a page where you can stop the alerts, and remove all of your related data from the site. Congratulations Simon,a very inventive mixture of clothes.I particularly liked the cream trousers and chukka boots with a navy winter coat. When is the article on the suede boots coming? I am in a predicament at the moment as to purchase a pair of double soled suede Arran boots by G&G thinking they will be very versatile and worn regularly. But I have a nagging feeling that a Chelsea boot would be a better buy. Really Like every item individually. Mostly like every item paired together but those cream trousers (gorgeous btw), really need a shoe that is significantly lighter in colour to go with it. I see this most times (especially in the summer), really light trews and really dark – in some cases, black shoes- it is a really jarring effect. The coat is really a masterpiece. Thanks. Would certainly never wear black, and it’s certainly an opportunity to wear paler shoes (which aren’t that common). Personally, though, I don’t think there’s anything wrong with slightly darker colours like this too, and it makes the overall effect less showy. I have been looking all my adult life for a hat that suits me and I had almost given up, but your piece has inspired me to have another go. By the way, very impressive ensemble, but I dread to think of the total cost – eye-watering I expect! True, though acquired over a period of three years so a little less painful for that! 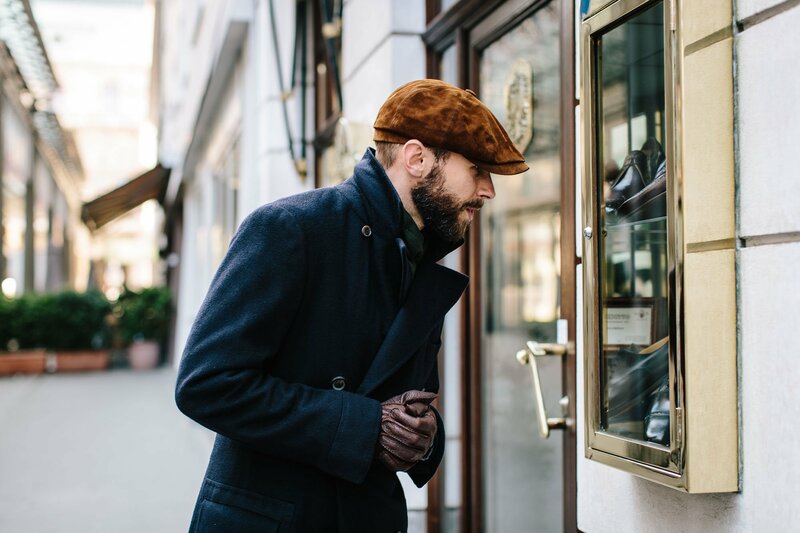 interesting story…I would appreciate a guide to buy a hat…is it in planning, or still in your blog and I have overlooked it? Simon, I simply love the entire look here. Although I am not a cap person (I don’t feel comfortable), I now wear a hat: took my 50th to convince me! My advice to less knowledgeable readers is simple: get good advice on what works for your face. I found the staff at Lock and at Trunk extremely helpful in that regard. Best, D ps love the coat! I think snuff suede boots would have worked with this outfit if there was no cap, but once the cap is there, you have to go darker as they would have clashed. Nice look. I recently bought a great eight-panel tweed cap at Lock, and got a couple of nice pointers from my salesman, Paul, that I found helpful. The first was to make sure that the cap was rolled a bit forward, and angled a bit. He said that creates the best lines for the hat. If you wear it too high on your head, the fabric doesn’t sit right and ruins the lines. He also taught me that the trick to bending the brim is to steam it, then bend. Such a great choice for a cap, Simon! Sorry but might have to get the same one. Just hope I can pull It off at least slightly as well as you! Should post more pictures of your other headwear, at least on Instagram if not here. I hadn’t thought a suede cap would look this good, but yours does work very well. The coat & cap combo has been a winner ever since Peaky Blinders, of course. This is a lovely cap! It’s really fine on you. I’ve tried different hats for Winter. The only one that works is rhe beret basque. So I have a navy blue one. Happily, it’s quite versatile. I think Ethan (Bryceland Co) would agree. In Vienna and in front of Materna’s shop. Right? Great outfit except the trousers. The cream turn the look into a uniform. Not my thing. Did you steam the peak before you bent it? 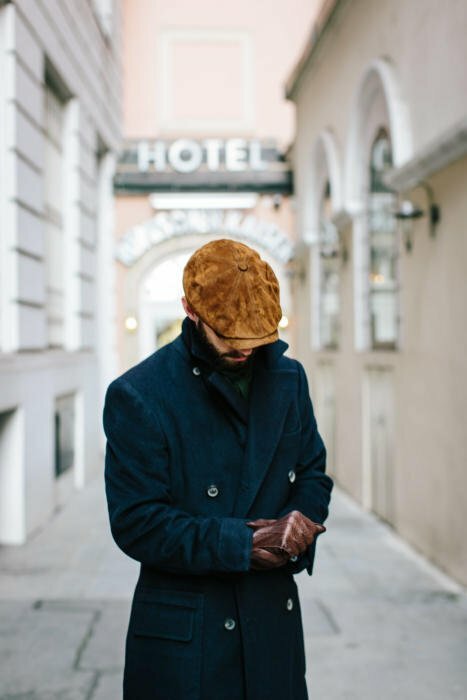 I’ve always thought it was odd that all traditional men’s hats, the fedora, trilby, flat cap, and even an astrakhan, leave the ears exposed to get cold. The only exception is the knit cap that easily pulls down over the ears for full coverage. All the other hats mentioned will sometimes have those inner flaps that can fold down to cover the ears, but I’ve thought they can look a little silly and detract from the style. Any thoughts on why this is the case and how you account for cold ears? Some flat caps with ear flaps can look fairly nice, but they can easily look silly. I sometimes wear behind-the-head ear warmers along with a hat. In New York’s winter’s it is necessary to cover the ears, particularly because I have to walk a bit of a distance to the office on days that are below freezing temperatures. Often the ear-warmers can be enough for me, but as I lose more hair I suspect they won’t be. Which store is that your are looking at? For city wear, I’ve never needed earflaps in England. They’re definitely necessary in the NE United States though – a cap without earflaps becomes a de facto “early Autumn cap” here and thereby not very versatile at all. Borsalino does a number of styles (with the Alps of South Tyrol in mind?). I believe the visor on the cap is to long, too far out. It would look better a couple of cm in. An excellent article! A coat of the length of yours in the pictures will go with both a cap and a trilby-fedora. 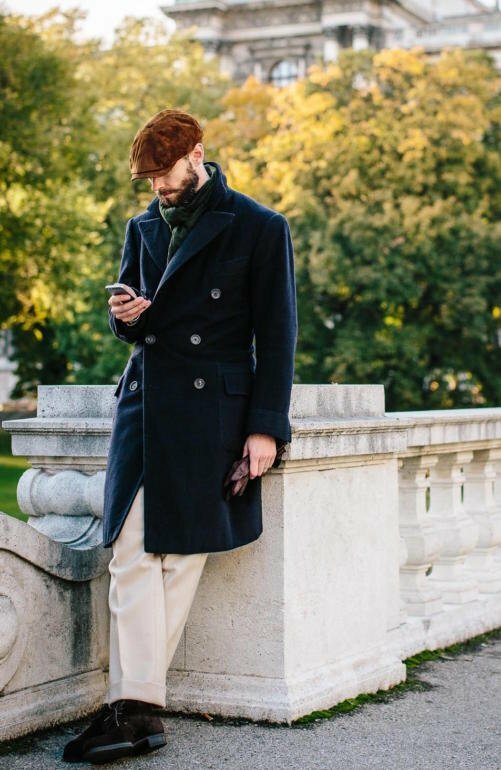 Jacket-length coats, I think, look better with caps than with brimmed hats. Great look Simon. I’m assuming you’re wearing knitwear rather than a jacket underneath. What colour would you recommend? I feel that a burgundy jumper would clash a bit with the green scarf and a pale grey might not offer enough contrast with the cream trousers? Navy obviously would work, but is there anything else that would? I’ve always been a Flat Cap wearer and am delighted to be in fashion at last! My present favourite is a newsboy style made from a heavyweight Donegal Tweed – it sits nicely and doesn’t flop like some of the lighter fabrics. I’ve tried on quite a few flat caps over the years, none of which ever looked that great on me. But last year I managed to find a very cheap one with a shape that I really liked. However, the head space is a little too large and I also find that it loses shape easily. Is there anyone in London that makes bespoke flat caps who may be able to copy the shape of and also make it the correct size for me? Hi Simon, what are your thoughts on the grouse / fishing hat? Typically, I wear beanies in winter and two tweed caps in spring / autumn, and might go for a fedora, but the grouse seems a good interim hat, for me at least. Some might consider it too rural, but it has the advantage of having being casual as well as traditional. As long as one isn’t dressed in a tweed suit of the same shade, it seems quite versatile, and nice to have another pattern in play. To be honest I’m not much of a fan. It looks either a little too old-fashioned, or at the other end of the spectrum, a little too hyper-fashionable. Very personal though. I can see that. 🙂 I think I’ll try it out on something I saw on ebay that’s very cheap, and that way nothing much is lost if it doesn’t work for me. Thanks Simon.